Generally, I'm a pretty busy person as it is. When it gets to the weekend, it's not really a time to relax; rather, it is merely an extension of the week. In fact, there are times that I need some weekdays to recover from the weekend. Chalk that up to activities with the kiddies and sports. So when I got a message from Jessica about a mid-afternoon meet-up with former Vancouver resident, now New York-based blogger Phyllis (Me Hungry! ), I really had to see if I could squeeze that in. C'mon, who am I kidding? Pass up an eating opportunity, especially with other foodies? It's like me refusing free samples at Costco. Ah yes... Sunday brunch at Costco... It's a cornucopia of little treats! 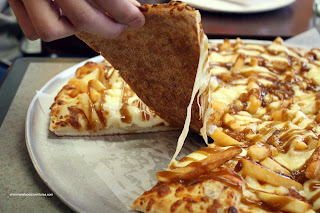 Anyways, Phyllis had the idea to try out Brado's Poutine Pizza out on the Drive. That sounded quite interesting. I showed up a bit early so that I could take some exterior shots of restaurants I had visited in the past. Why? Because I wanted better pictures! Yah, chalk that up to my OCDness... Finally meeting up at Brado with Jessica, Mark, Phyllis and Kris, we were wondering if Kim would show up. Of course he would. And bearing treats from Cake-Ya! This... was not going to be a low-cal aftern oon! Now, the actual "restaurant" itself is a bit strange. The actual store is shared by another business that really has nothing to do with Brado specifically. With limited seating, we essentially took all the tables. Phyllis and Kris were generous enough to treat us to the Poutine Pizza. 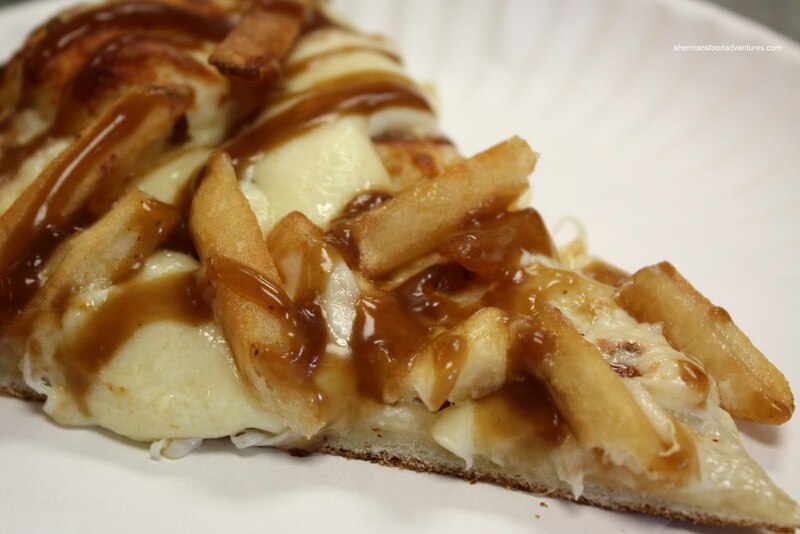 As the name implies, it's a pizza with lots of cheese, gravy and fries. For me, the actual taste of the pizza wasn't bad per se. It resembled eating poutine on top of pizza dough. But therein lies the problem. We have starch on top of starch. Not really my thing. I thought the crust could've been lighter considering the heaviness of the toppings. With that in mind, I had try their actual poutine. 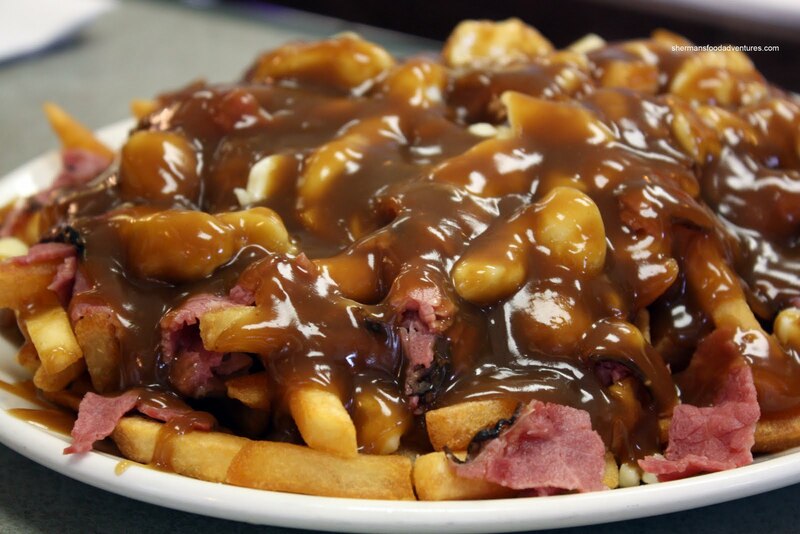 Thus, I got the large Smoked Meat Poutine. When I got back to the table and informed everyone of this, I got looks of shock. Apparently, their large is extremely large. So large, it makes Belgian Fries largest size look like a small. No matter really, I was going to share it with everyone anyways. Besides, it wasn't that expensive at around $8.00. Yah, when I did get it, it was freakin' huge. I'm not sure even in my finest hour (or worst) that I could finish it myself. As we dug into the poutine, I noticed that there was quite a lot of cheese curds (although most of it had melted). Thus, I couldn't necessarily get the squeak I was looking for. I did like the gravy, it was on the salty side; but it was hot and thick. As for the fries, I personally couldn't stand them. They were of the generic frozen variety. Call me a fry snob; however, I would much prefer fresh cut potatoes that are double-fried. With all that being said, the owner is a charismatic guy who cares about his business. I think with some tweaks with the pizza and the poutine, it can be much better. Long time no talk. Was busy. Now i'm back. Hey Sherman, was so great to meet you! Thanks for treating us to that giant smoked meat poutine, it forced me to try something new since I never seem to order anything but classic poutine. And I totally hear ya on the fry thing, my hubby is a fresh cut fry snob as well. 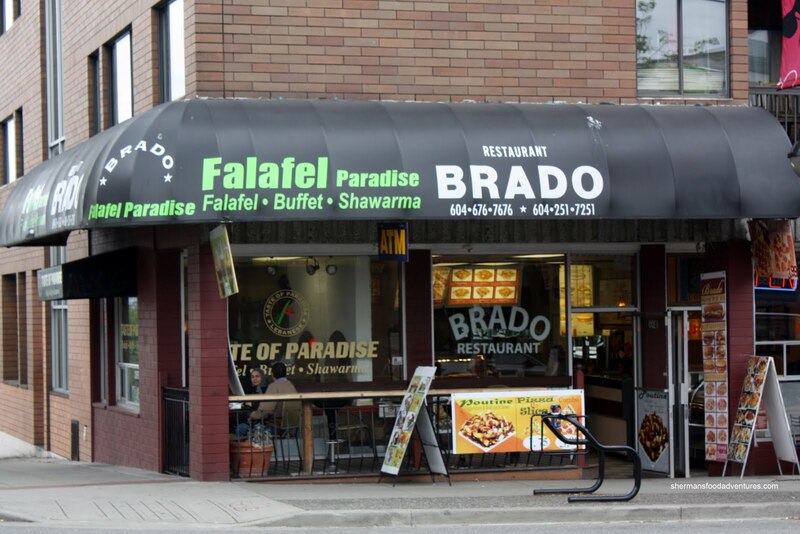 Hopefully Brado will remedy the fry situation and go back to his original milder gravy. LOL Anson, not gonna try that BBT! Phyllis, it was great hanging out with you! Kris is a smart man... LOL... Hope to meet up with you when I make it out to NYC! 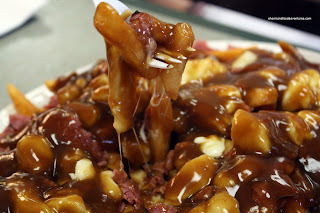 Mmmm, I love poutine! Photo's make my mouth water! OK, hurry up and get out here (before I move back to Vancouver). I need someone to share Momofuku's bo ssam and Ma Peche's 'beef 7 ways' with me LOL.